On site security protects your project assets. Licensed security officers, both armed and unarmed. Commercial & Residential patrol service for all types of properties and businesses. Professional Security, Inc., provides private security services to businesses and organizations across Western Arkansas and Eastern Oklahoma. We can provide onsite security guards, patrols and a variety of investigation services. Security guards can be either armed or unarmed and can provide long-term contracts or single day or single event services. Our experienced personnel are veterans in the private security industry. Centurion Security is our Northwest Arkansas based company that focuses specifically on security services for Fayetteville, Springdale, Rogers and Bentonville and throughout Northwest Arkansas. Centurion Security is managed on with the same approach and the same security principals as Professional Security. We provide local security operations supervised by active management providing excellent security operations teamed with quality customer service. If your security firm needs to fill short-term security in Arkansas or Oklahoma our affiliate program can meet your needs. We frequently provide security services for commercial trade dress, computer or security updates or any work that requires after hours access to a store or company. Click here for more information on becoming an affiliate partner. 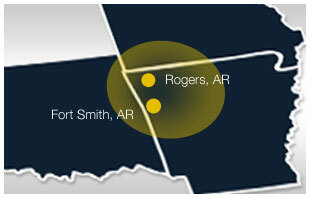 We serve the entire Arkansas River Valley area from our Fort Smith office. We also provide security services in Northwest Arkansas (Fayetteville, Springdale, Bentonville, Rogers). Our service area extends into Northeast and Southeast Oklahoma, as far south as Mena, Arkansas and to the east to Conway and Central Arkansas. We can also provide security services for southwest Missouri in the Joplin area.